3 Bedroom Semi Detached House For Sale in Stoke-on-Trent for Asking Price £280,000. This stunning period property boasts, stripped pine doors, picture rails, ornate fireplaces, wooden flooring, and high ceilings. 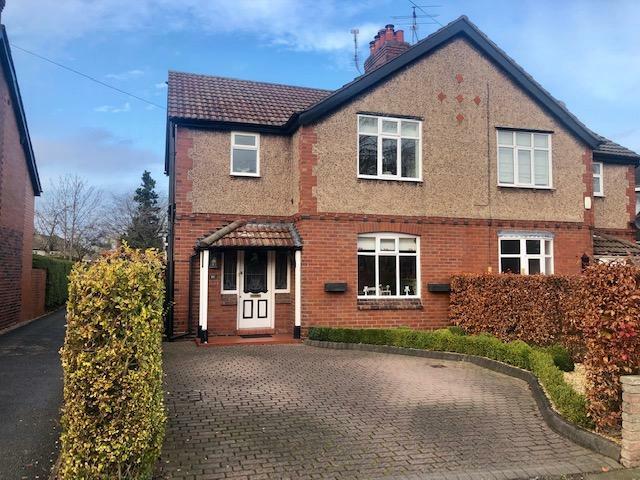 Being located on one of Alsager's most favoured roads, which is within easy walking distance of the village, schools and leisure centre. Internally the very well presented accommodation briefly comprises entrance hall with wooden flooring, lounge with multi fuel burner, dining room, fitted breakfast kitchen, landing, three bedrooms and a fitted family bathroom. Externally there is off road parking and a single detached garage to the rear of the property complete with a rear garden which offers a good degree of privacy. Viewing is strongly recommended. Pine stripped door leads you to the very light dining room, exposed floorboards with beautiful ornate fireplace and surround with tiled hearth, UPVC double glazed window to front elevation, single panel radiator, picture rail, high ceiling. Double size room UPVC double glazed window to rear elevation, double panel radiator high ceiling. Four piece period white suite comprising pedestal wash hand basin, panelled bath, WC, built in double width shower with screen, tiled walls to half height with decorative border, obscure UPVC double glazed window to front elevation, double panel radiator. The property is approached via a block paved driveway, providing off road parking. there is also a single detached garage accessed via a tarmac driveway to the side. The rear garden is very established and offers a good degree of privacy and has deep filled borders and a patio area.